Digby Neck is a rural community in South-West Nova Scotia. It is a long narrow peninsula running parallel to the south-west shore of mainland Nova Scotia. It measures roughly 40 km long and 5 km wide. With the Saint-Mary's Bay on one side and the Bay of Fundy on the other, Digby Neck is nearly surrounded by water. Because these bays are part of the Gulf of Maine, they have the highest tides in the world. The Bay of Fundy is teaming with life which means that its shore-line is as well. Many whales and sea birds can be found off of Digby Neck and there are a variety of whale and sea bird cruises available which can show them to you. 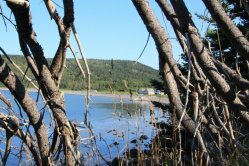 Digby Neck also has several beautiful beaches such as the Sandy Cove beach, which was originally discovered by Samuel de Champlain.